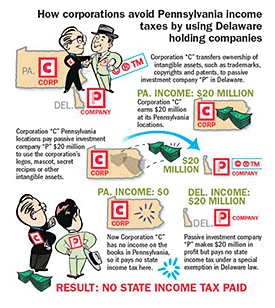 More than 70% of corporations in Pennsylvania do not pay any income tax! Corporations like Walmart, Home Depot and Toys “R” Us use the Delaware tax loophole to avoid paying taxes on their income. Tax loopholes cost us, the taxpayers of Pennsylvania, hundreds of millions of dollars each year. This money could be used for education, health care, protecting our environment and helping working families. It is time for our elected officials to close tax loopholes and make the state’s tax system fair for all Pennsylvanians and all Pennsylvania businesses.